Auto Universal Chock automatic wheel chocking system. TIEMAN Industries has released an automatic wheel chocking system for vehicles while they are loading and unloading that can help prevent accidents and loading bay damage. The Auto Universal Chock is a ground restraint for trucks that offers reliability and eliminates risks to people, property and equipment without having to rely on underride guards. It has been engineered to perform in demanding environments and tough dock applications and will operate with virtually all vehicles including those with tail lifts. The Auto Universal Chock is flush mounted in the driveway and connects to driveway drainage systems to keep water from building up in the housing. The electrical components are remote mounted inside the loading dock and not in the outside housing. The chock movement keeps tracks clean of debris. It has self-bleeding hydraulics and self-lubrication for virtually maintenance free operation, making the unit rugged and reliable. The chock pressurises against the vehicle tyres holding the truck against the loading dock for security and safe loading. 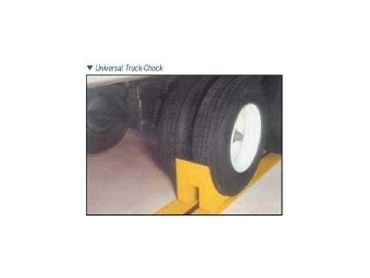 The Auto Universal Chock has been developed to operate under all types of weather environmental conditions. Its exterior has printed communication signs for truck drivers, and internal and external LED traffic lights that indicate to the driver and dock personnel the status of the chock for effective communication and safety.